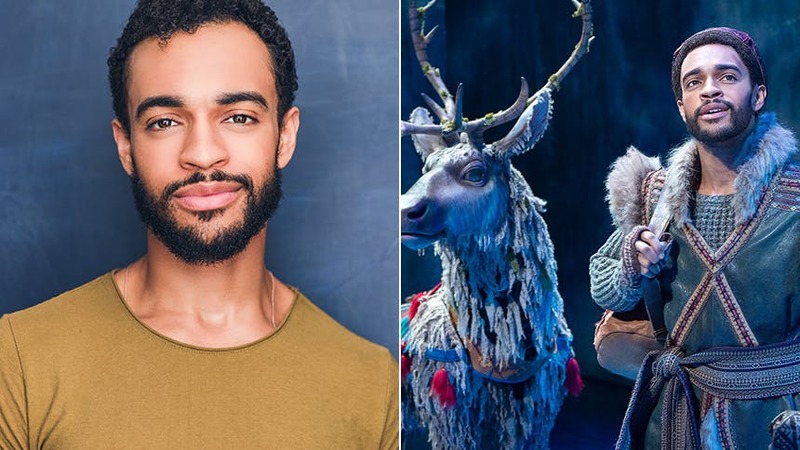 Noah J. Ricketts stars as Kristoff, the romantic lead who is also a bit of a fixer-upper, in Disney's hit musical adaptation of Frozen. Noah made his Broadway debut as A Drifter in Beautiful and was a part of the original Broadway company of Frozen before taking on the role of Kristoff full-time. Scroll on as BroadwayBox gets to know Noah a bit better as he talks bringing heart and charm to Kristoff in Frozen, his ultimate Disney princess, and an alarming audition story. 1. Tell us about your Kristoff. Who is he? What did you want to bring to him? My Kristoff is a simple, direct and slightly misunderstood guy who just wants to do two things: make some money selling ice and hang out with his reindeer. I wanted to bring an all-knowing practicality to him, a touch of charm, and a lot of heart to my Kristoff. Behind his tough exterior is a big, warm heart and having that shine through is what’s most important to me. 2. What’s your favorite onstage moment with your Anna, Patti Murin? My favorite moment with Patti definitely has to be on “the bridge.” In rehearsing for the second year, we left some blocking open for interpretation—to keep things spontaneous. So, by the time we reach the bridge we are constantly playing back and forth to keep each other on our toes. You never know what you’re gonna get up there! 3. What Disney property was your absolute jam growing up? 4. What are three things you always have in your Frozen dressing room? Three things: chapstick (Blistex of course), brown sugar cinnamon Pop-Tarts, and a bluetooth speaker for blasting music. Essential. 5. Do you have any pre-show rituals? Ooo yes. Black tea, 20-minute vocal warm up with my incredible voice doctor Wendy LeBorgne over the loud speaker, and some serious foam rolling with Ryann Redmond. Oh, and lots of joking around too. One of my most memorable auditions to date was singing “Empty Chairs at Empty Tables” for a production of Les Mis. And I was really feeling it, and just as I got to “Oh my friends my friends…” the fire alarm went off. We didn’t really know what to do so we stared at each other and left the room. I didn’t get it. 7. What was the most useful thing you learned during your time on Broadway and on tour with Beautiful: The Carole King Musical? I learned to find that beauty in every single performance. Doing the same thing eight times a week can be difficult on the mind. It was my first long-running production, so I had to figure out a way to make each performance special. I talked to an actor from another touring production and he reminded me, “Just remember it’s someone’s first show and someone’s last. So, give it all you’ve got.” In that moment, I decided I would be fully present at every single show and give it all I’ve got. I’ve carried it with me ever since. 8. What was the first musical you were truly obsessed with growing up? Little Shop of Horrors. That movie. My god. I don’t even want to know how many times I watched it. I loved the incredible music, that terrifying plant, and the simple fact that I got to root for the underdog! Seymour is still on my list of roles I’m DYING to play. 9. What is your pop culture guilty pleasure right now? I’m loving that fashion is going so ‘90s right now. It’s taking me back to my childhood and reminding me of simpler times. Personally, I still love a vintage ‘70s vibe—but seeing the clothes on other people (especially the younger generation) is totally awesome and DOPE. 10. What’s one thing that’s 100% hygge for you right now and one thing that’s not hygge? Upstate escapes on my off day are totally HYGGE right now. Definitely need that time away to recharge. The MTA ... NOT HYGGE. Don’t miss Noah J. Ricketts as Kristoff in ‘Frozen’ at Broadway’s St. James Theatre.